I photographed this beetle larva on August 9 on the undersides of the leaves of my double flowered green-headed coneflower. 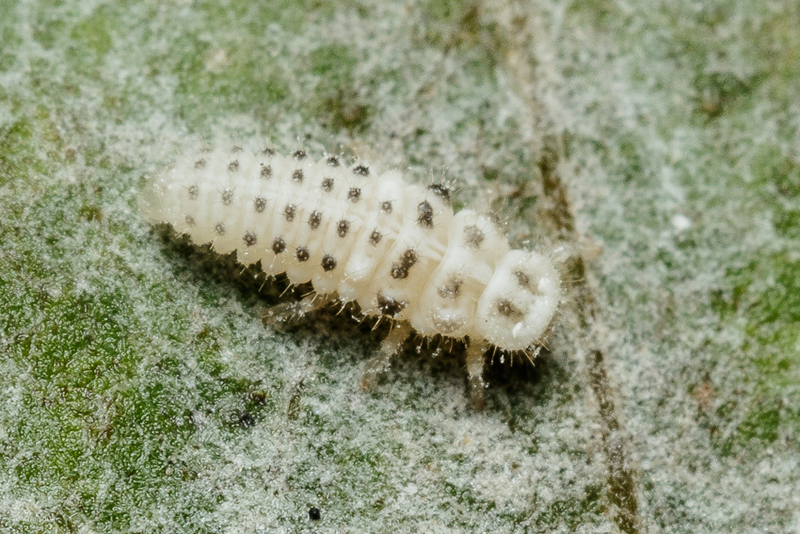 I thought it was a long shot to identify, but thank you to bugguide.net and James Bailey who confirmed that this is the larva of the twenty-spotted lady beetle, Psyllobora vigintimaculata. The adults are brownish and white, quite different when compared to the typical red and black of the more familiar species. This photo is a particularly nice image of an adult. Now I need to find one and photograph one- I would imagine this larva, if it survived, would be an adult now.